Here is a great activity to teach one variable equations using Excel (Google Sheets, etc.). This is a great activity for 9th and 10th graders completing Algebra 1/Integrated math, or for 8th graders working on one variable equations. Why Use Real-World Math Connections to Teach One Variable Equations? When working on topics such as how to solve one variable equations, it is important that students understand how the math they are learning ties into the real world. Otherwise you will constantly be faced with the, “when am I ever going to use this in real life?” question that high school students love to ask. In this task, students will create and use an Excel spreadsheet to calculate weekly total earnings, and summer total earnings for three people. They will then determine the equivalent algebraic equations. You can get the full lesson and supporting documents here for just a buck. Show students exactly WHERE to put the information. Make sure students understand how the cells in Excel are labeled. Be sure they have a way to watch you as you are demonstrating. I recommend using a document camera or SMART board to demonstrate. Show students exactly WHAT to put in the cells. Be sure to explain that Excel is VERY particular. Putting a comma or equals sign in the incorrect spot can alter the formulas, and may give your students error messages. Distinguish what aspects of Excel you allow your students to personalize (fonts, colors), and which elements should be standardized. Allow students to work in partners to complete the activities as appropriate for your classroom setting. Working with partners can help students to problem-solve before they come to you with their questions. Allow students to view a finished example to compare their work to yours. This lesson can be completed in one or two class sessions, depending on the length of your class and the familiarity your students have using Excel (Google Sheets). Be sure each student has a copy or access to the first student sheet. This activity includes step-by-step instructions for the students, but you may need to further break-down certain parts of the lesson (such as how to create a new sheet and how to rename each tab). Get it here. 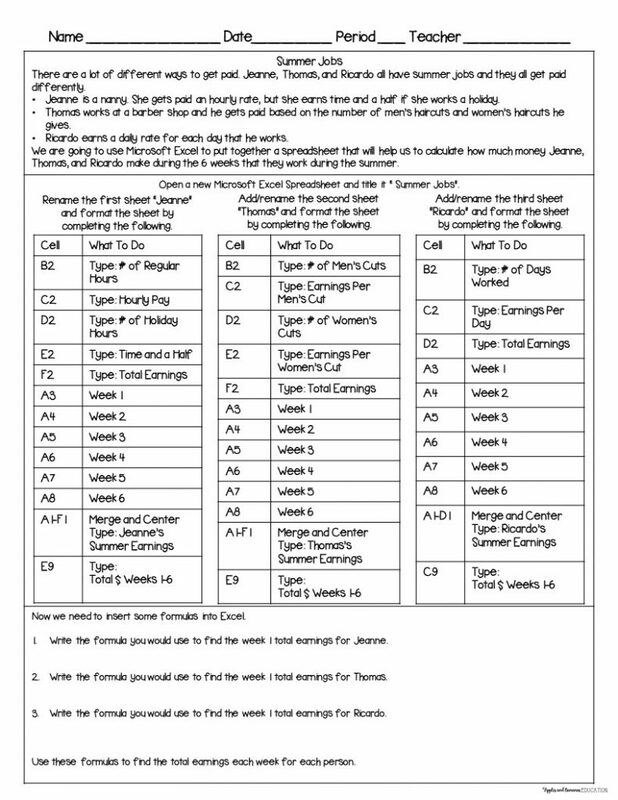 After students have followed the directions for creating their three sheets for Jeanne, Thomas, and Ricardo, stop the students and discuss how they would go about finding the answers to the Week 1 total earnings questions for each person. Explain that Excel recognizes and can calculate these formulas, but that they must be put into Excel in a certain way. Have students follow along as you model how you would calculate Jeanne’s Week 1 earnings. Clear up any misconceptions, and make sure that students practice putting it into their Excel spreadsheet correctly. 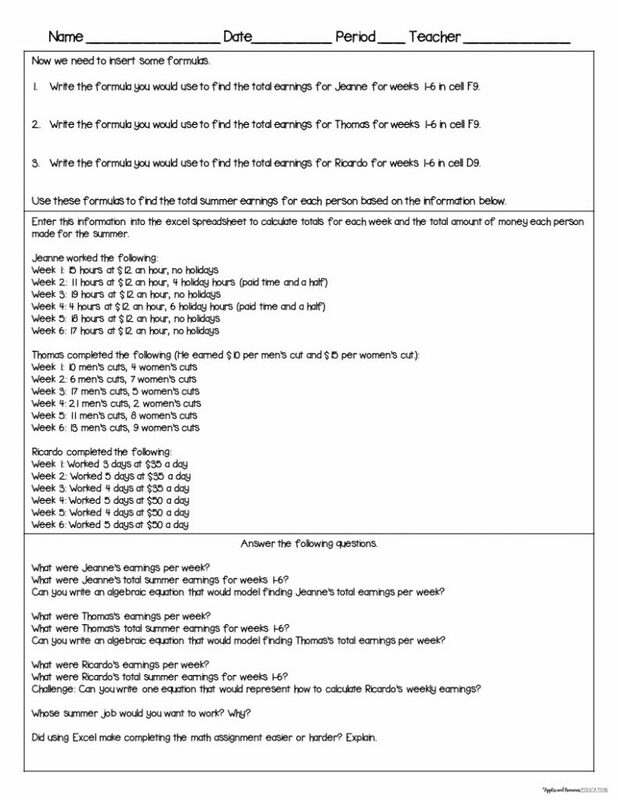 When all students have completed this first formula, allow students to practice the next two questions (Week 1 earning for Thomas and Ricardo) on their own. After you feel that students are comfortable, you can pass out the second part of the assignment. Students will probably need some support with the top section, so they are aware of how to use “sum” and the colon (:) to add a column of sums. Student will then insert the data given on the second student handout. You may want to check in with students after they have finished the first sheet to be sure it matches the teacher Excel sheet provided. Students will finish the lesson by completing the bottom half of the student handout. This activity can be extended in many ways depending on time. Students can compare weekly and total summer earnings for the three people. They can manipulate the rates and the hours that the people are working to see how the people could increase their earnings to specific amounts of money. There is a lot of room to revisit this activity at different points in the year. You can relate it to graphing skills, the percent of the total summer earnings earned per week, etc. For the student sheets, teacher answer keys, and completed teacher Excel sheets, click here. Click here to sign up for our list. Receive monthly newsletters and access to our member-only Resource Library.